There’s an argument, which we’re about to make, that Fish’s solo career was cooling by the time he came to make 1994’s Suits album. Polydor had ditched him, record sales were becoming something of a diminishing return and he’d recorded a covers album in the shape of Songs From The Mirror. A nod to Bowie’s Pin Ups it might have been, but a covers album always gives off the faint whiff of an artist casting around for ideas when there are none. Argue that all you like, but Suits is the sound of a singer coming out swinging: he sounds like he’s actually squaring up to fight in the lyrics to Emperor’s Song. Little surprise then that it went Top 20 in the UK, though it would be Fish’s last commercial hurrah for some time. And its success sits at odds with ever-revealing liner notes that Fish provides in this dense and colourful three CD set. As engaging as the extra disc of demos and live disc are, it’s the essay and notes themselves that make this reissue such a gem. Which is not to discount the album itself. 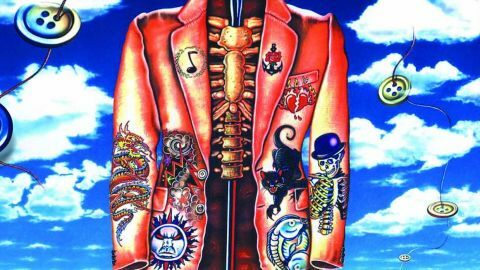 Fish hit a rich creative seam with Suits, he was embracing the musical zeitgeist – the production, the arrangement, the tone – but age has not withered its magic, which you don’t often get to say about an album released in the 1990s. Pipeline, Mr 1470 and Bandwagon are especially strong still, and while Fish leaves little of himself off the page lyrically, he’s even more direct when it comes to conjuring up the life and times that surround the making of this album and the aftermath. You’d be hard pushed to describe a Fish album as upbeat, but this sounds like a record of high end pop songs juxtaposed with the downbeat end to the essay that accompanies it; poorly attended shows, family woes, times of trouble looming up ahead like clouds crowding the horizon. This only adds to its irresistible charm, one final splash of colour to enjoy before the crash.